Honor was all set to head off to her dream school in Austin when she received the devastating news that her older brother Finn died in action in Iraq. 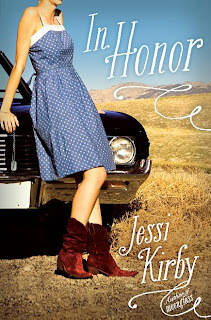 When a letter from Finn with tickets to a Kyra Kelley concert arrives after his death, Honor takes it as a sign and jumps into Finn's old Impala and heads for the concert in California. But before she can even leave, Finn's (estranged) best friend Rusty insists on joining her. Honor isn't sure why Finn and Rusty stopped being friends and she definitely doesn't want his company, but she doesn't have a choice. As the landscape flies by, Honor and Rusty share memories of Finn and slowly start to recover from the shock of losing him...until Rusty uncovers secrets that Finn kept from Honor. 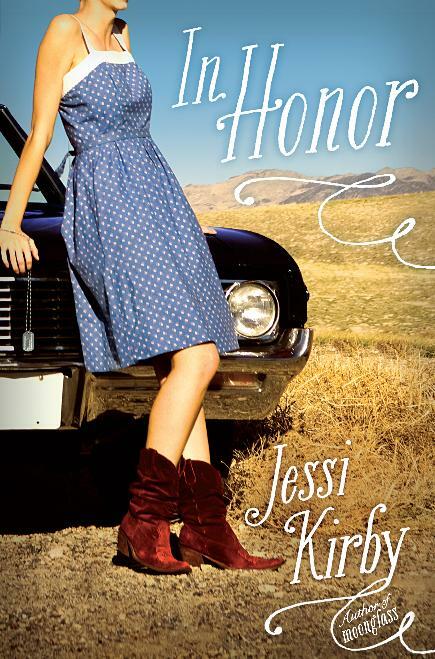 Jessi Kirby's second book is an absorbing and emotional road trip read. It opens up with some incredibly sad scenes as Honor processes and deals with the death and funeral of her brother, his last wishes, and the letter that arrived too late. She and Rusty clash instantly, but their shared history with Finn and the pain of his loss forces them to find a way to get along. Rusty is charming in an unconventional way, and he'll definitely appeal to readers who like male leads who wear boots and listen to country. There are also a lot of secrets to be uncovered throughout the book, and even they were told in order to protect Honor, who is sometimes a little naive, Honor comes off as a strong character who must learn how to be an adult a little too quickly. Though the book is thoroughly contemporary, there is a light element of serendipity that gives In Honor a sort of magical quality without being completely unbelievable, and readers will love the magical settings and perfect final scene. Kirby is a fantastic writer, and In Honor is a memorable book. Cover Comments: I love absolutely everything about this cover--the classic car, the dress and boots, and the font...except when you look closely at the model's neck and chin, it looks like a guy's neck and chin. And it didn't bother me until I noticed it. However, it's not very noticeable, so no big deal! I'm about halfway through this and finding that I am just not a big fan of roadtrip books-I'm frustrated with all of their delays and just want them to make it to the concert so that Honor can get off to school in time. I've seen such great reviews for this title. I actually sent the Kindle sample to myself but haven't read it yet. I like the idea of the "magical" element w/o it being unbelievable in the end. And who doesn't love a perfect last scene? Isn't that why we read, to find those perfect scenes that make us smile?